We got a late start out of Paris on Friday night, so it was a race to make it to Lyon before Restaurant Paul Bocuse closed for the evening. After having watched the “Bocuse D’Or” cooking competition (think Olympics for chefs) on the Food Network, we have always wanted to eat at Paul Bocuse’s restaurant in Lyon. And driving to Italy was our perfect chance! M. Bocuse is one of the most famous chefs in the world, widely credited with being one of the first chefs to emerge from the kitchen and to enter public life. He is also known for creating the “Nouvelle Cuisine” movement in France: a focus on fresh ingredients of highest quality over heavy sauces. Needless to say, dinner was superb! The dessert cart and cheese course (during both of which we could choose as many items as we wanted) were the definite highlights. The next day, we had just the morning to spend in Lyon before heading off on our six hour drive through the Alps to Italy. Although we spent only a short time in the city of Lyon, we really enjoyed it and would like to return some day. The Roman ruins (in both the Amphitheatre and Museum) are spectacular. 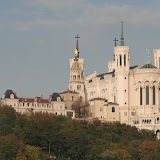 And the Basilique Notre -Dame de Fourvière is one of the most delightful churches I have visited. Our favorite part of the town was the “vielle ville” where traditional architecture remains, including the famous “traboules” or connective passageways. The layout of Vieux Lyon is such that there are very few connecting streets running perpendicular to the river. These shortcuts thus allowed workmen and craftsmen to transport clothes and other textiles through the city while remaining sheltered from inclement weather. However, they served other purposes throughout history too…especially for the resistance during WWII. The traboules of Lyon are often credited as one of the reasons why the occupying Nazis were unable to take complete control of these areas. After purchasing the necessary picnic supplies for our drive to Italy, we set off on the road. The drive was just as beautiful as we could hope for. The leaves were changing colors, so all the hills were different shades of green, yellow, orange, and red. All the way to Lucca, we truly enjoyed the scenery. On our way back to Paris, we stopped this time in a different part of Burgundy, near the celebrated wine village of Beaune. Since we were driving, we booked ourselves at a chateau in a small town of Auxey-Duresses just a ten minute drive outside of Beaune. Yes, you heard right, a chateau! It was Chateau de Melin and was absolutely beautiful. We were the only guests, since it was low season. Our room was enormous and beautifully furnished…and there is just something amazing about staying in a chateau in France. During the day, we drove around the beautiful countryside and visited some tasting rooms. Unlike in Napa or Sonoma, it is quite unusual to visit the wineries themselves (and you must make reservations in advance). But you can stop in the tasting rooms in many of the small towns where they will offer you several glasses of different wines from the region, and the option to purchase your favorites. We also visited the Hotel Dieu (Charity Hospital) in Beaune. The highlight of the trip was certainly our dinner at Le Relais de la Diligence…and most certainly the highlight of Zookie’s entire European experience thus far. They actually have a “Menu Toutou” pour les chiens (for the dogs)…so he feasted on ground beef, pasta, and doggie biscuits, while we had venison and steak. If anything, it made for some hilarious photos!